One of the most brilliant gifts of motherhood is watching your kids develop their own personalities, likes and dislikes. I am blessed to mother two strong, brilliant, adventurous kids who don’t think anything is beyond their reach. It’s amazing. If you are a regular reader, you know that both of my kids adore cooking with me. Will, who currently wants to be an archeologist, will undoubtedly love spending time in the kitchen no matter how old he is. I love that he goes through cookbooks with the same intensity that I devour them and that he will pick and choose recipes that look good to him. This morning, he was flipping through a cookbook and selected a recipe that he wants to make this week. It involves stuffing peppers with a brilliant veggie mixture. It’s colorful and pretty and filled with things that they absolutely love. Tomorrow, we will make it and if it goes well, then you will be hearing more about it next week. In the meantime, I decided to turn the tables on the kids today. Rather than cooking with me, I gave the kids the tools to cook for themselves today. Will gave me the idea when he saw the photo with the recipe and started talking about couscous since it looked like it included Israeli couscous (it didn’t though). 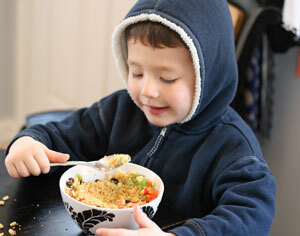 Since Will wanted couscous as a result and I wanted an easy lunch before rushing Will off to school, I improvised. I don’t know about you, but when I was a kid, I loved the idea of anything with a Make-Your-Own component. Make-Your-Own Sundaes was (and still is) an incredible favorite of mine. More toppings? Yes, please! But seriously, this is a great kid-friendly way to make lunch fun and exciting, while also making it a little easier for you. 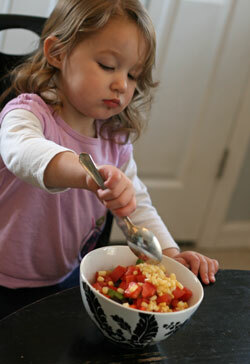 Being empowered to choose and make your own food is just so exciting, especially when you are little. My kids definitely feel the same way. Once I explained what they would be doing, they couldn’t get to the table fast enough. 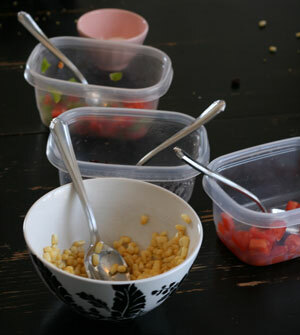 The process is easy: arrange potential mix-ins for the couscous in bowls with spoons for easy cutting. You can cut up veggies, pull out leftovers leftovers, and get out oil, nuts, seeds, cheese, beans … the possibilities are endless. Then you just let the kids put their own concoctions together. Easy peasy. 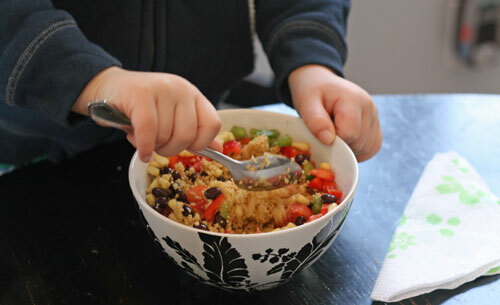 Be sure to use oversized bowls so that they have room to stir without knocking everything out of the bowl. Trust me on that one. Divide the couscous between bowls for each person. Top with a pat of butter. Allow kids to scoop ingredients in (remember, this should be fun so they don't have to take everything). For younger kids, ask how many scoops of each item and have them count them out with you. Once each child has added all the ingredients desired, sprinkle with salt. Then, have them mix well. I totally believe that the more involved kids are in the process, the more invested they are, and likely the more interested they are in the food. Make-your-own is a great way to go. We did salads last night, with everyone choosing their own toppings. Happy people all around. 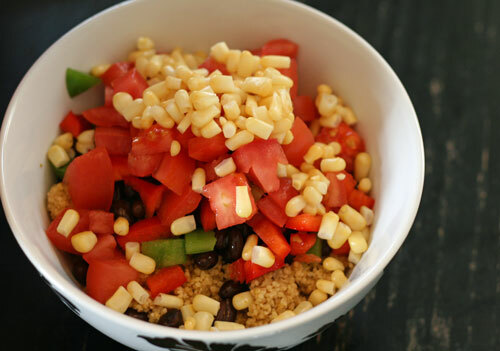 The avocado and red pepper Israeli couscous (with black beans) was a winner! Thanks for the great recipe. I love how Will wants to be an archeologist when he grows up. When my 14-year old was in elementary school, he wanted to be an environmentalist. Now he’s in high school … and he wants to be a “millionaire.” Yikes. What are they teaching those kids in high school?! 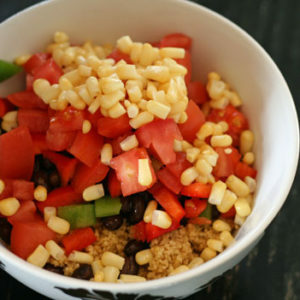 So fun how you used couscous as your base for a make-your-own side dish. I’m working on recipes for my second family cookbook and just this week, added the final touches to our side dish chapter. Your couscous creation reminds me of a brown rice dish we whipped up using brown rice as the base mixed with carrots, corn and peas.